Evelyn is a little girl who lives with her parents and brother in a house with a big backyard. On nights when the sky is filled with brightly shining stars, she loves to go outside before bed to see the Milky Way and the Big Dipper and dream about the planets. But Evelyn has a secret: She is able to see flashes of light streaking across the night sky that no one else can see. And she’ll soon learn that her secret is actually a wonderful gift! George Yuhasz is a passionate advocate for the preservation and protection of our natural world. 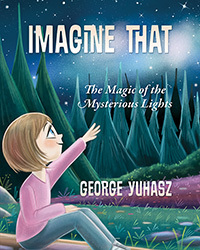 A proud father and grandfather, lifelong learner, and world traveler, he especially delights in sharing with children his knowledge and enthusiasm for appreciating the joy and wonder of connecting with nature.George lives in the Blue Ridge Mountains of North Carolina and is currently working on another children’s book and a suspense novel.